Last week's sudden decision by AAF control owner Tom Dundon to suspend all operations indefinitely caught literally thousands of people off guard. One day the Alliance is a functioning business, the next day it closes its doors, perhaps for good without future capital investments from a source other than Dundon. The shutdown left a lot of people without jobs and, just as importantly, without being paid or taken care of. Dundon lost $70 million on his own (and may not be done yet), but there have been horror stories popping up left and right about players being left out in the cold or stiffed with a bill they shouldn't have had to pay. It's a bad situation no matter how you spin it, and that creates a lot of sympathy for the affected parties. And that's how it should be. A lot of good people made life-changing moves to work for the AAF and legitimately wanted it to succeed. Now, save for a select group, they're without jobs, and by the end of the month, health insurance. There are also numerous vendors who have not been paid in full (or perhaps at all) for services rendered. How does the AAF rectify that? Plenty of questions remain on those fronts. But in dissecting the fallout of the AAF's suspension, it's important to have clarity on exactly who is affected and in what capacity. For example: stories of players having to find their own flights home seem cruel when coupled with the fact they were just let go. However, CBSSports.com was told by multiple AAF officials, who have either already been terminated or will be soon, that players finding their own transportation home was part of a previously existing exit agreement. That may not enhance the optics, but it gives you some context. Obviously, though, players weren't the only group affected by the AAF's shutdown, even if they are the most prominent. Here's what they, along with every major party, had to deal with from last week's closing. There's a lot of sympathy towards the players formerly employed by the AAF. That makes sense. They were the headline stories with unique backgrounds. Many of them were looking for another chance at the NFL. 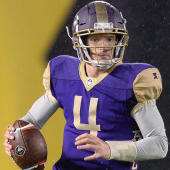 Since the AAF made it a point to parade that they were player-friendly, letting them go by the hundreds naturally raises a lot of questions about the Alliance's sincerity. But in speaking to both players and Alliance sources, it did seem like the AAF genuinely cared about the guys on the field. Players received a weekly game check of $7,000. While the quick ending to the season meant players weren't paid for all 10 regular-season games, they did receive everything to that point. They were housed and fed. One player said his team received a $900 roster bonus that could be used for their flights home. Injuries are a point of concern. There are horror stories about players like Salt Lake Stallions linebacker Gionni Paul, who broke his arm days before the league halted everything. His medical care is obviously a top concern, along with all of those who suffered serious injuries this season. CBSSports.com was told by an AAF source that players are still eligible for worker's compensation and that the league is reaching out and working with them to try to get their injuries taken care of. The source said the suddenness with which the AAF halted created chaos in handling these cases. Additionally, there are wild stories about players being footed with hotel bills they shouldn't have. This gained a lot of steam when Adrien Robinson, formerly of the Memphis Express, tweeted that he was billed for more than $2,500 for his room in the team's hotel. However, an AAF source said that Robinson should not have been charged for his room -- nor any player who received a similar charge. The source said that a paper check (the hotel would not accept wire transfer) was in the mail at the time of the shutdown, which is when Robinson was charged. According to league information, players who have been incorrectly charged for expenses that should have been covered by the Alliance are eligible for reimbursement by April 15. The nightmare scenarios aside -- and, hopefully, there will be a resolution to all of them -- the mileage of each individual situation varies. A young, single player who never got hurt, collected his checks and knew the risks involved with being cut/terminated at any point might not feel too terribly about being laid off. A player who moved his family across the country, got them set up with housing and schools, and then got hurt probably has a far different perspective on how things went down. Some players went on to immediately sign contracts with NFL teams, showing for sure that the system worked. But those numbers for now are few. Like players, the reactions from coaches and general managers has varied greatly in the week after the AAF halted operations. Generally speaking, GMs are disappointed in how things ended, but their careers are already far more established. More than one shared the sentiment that they joined the AAF because they loved the relationship and development aspects of football. They were back doing what they loved and believed in the mission. But in being terminated, they would simply move on to the next thing. That outlook is shared among a lot of head coaches as well. Commanders coach Mike Riley will stay in San Antonio for a while because he has family there. Maybe one day he'll go back to Oregon State. Arizona Hotshots coach Rick Neuheisel may look for another coaching job elsewhere. He truly loved what he was doing. Steve Spurrier is probably looking forward to his next round of golf. They'll be fine. At the assistant level is where things get complicated. While some assistants are friends of their head coaches, and the AAF was an act of getting the band back together, others were jumping at a major opportunity. One assistant coach moved his family of four, including two toddlers, halfway across the country because he believed it would help advance his career. Another was flying back to their home state, looking for whatever came next. Both collected their final check, having done a year's worth of work in just a few months. In all, they were being paid about 25 to 30 percent of a yearly salary. What's more is that with college football spring practice underway and the NFL in the offseason, no one is hiring. Assistant coaches were let go at the worst possible time without any more money coming in. This is among the biggest yet widely under-appreciated groups that will have to find ways to move forward. One can argue that they're the most affected group because they'll lose out on being paid, and they may not have a case to recoup any damages through litigation because they were on at-will contracts. Multiple sources confirmed to CBSSports.com that they were under the impression the AAF would have enough funding to last at least two or three years. Support staff includes pretty much every job title you can think of and then some: equipment staff, training staff, communications staff, front-office staff and more. They were by and large full-time employees who received their last paycheck at the end of last week. Like pretty much all contracts, these support staff members were at-will employees. They can be terminated at any point so long as it's not done illegally. However, like coaches and players, some of them picked up their lives to join the AAF and will now have to file for unemployment. Depending on their area of expertise -- equipment and training staff, for example -- it's not hiring season, either. If you're looking for potential lawsuits, here's where you might start. A lot of companies, big and small, partnered with the AAF. To run a football league, you need moving trucks, chartered planes, hotels, stadiums, contractors, catering -- massive infrastructure that needs to be paid. In multiple cases, that has not happened. WFTV reported that UCF's Spectrum Stadium was never paid for the $1 million agreement it had with the AAF to host the Orlando Apollos. The report also said "it is believed the UCF Athletics Association never sent an invoice to the team." While CBSSports.com could not independently confirm that yet, another source said Arizona State's Sun Devil Stadium, where the Arizona Hotshots played, still had a sizable outstanding debt as of last week. These are just two examples. CBSSports.com is working to confirm numerous stories similar to these. How any outstanding debts will be paid off if Dundon stopped funneling money into the operations remains to be seen.